Barrick Gold Corp. (TSX:ABX) CEO Jamie Sokalsky announced spending reductions of a minimum $500 million and the potential sale of non-core assets at the company's annual shareholders meeting on Wednesday. Sokalsky told shareholders that he feels their disappointment and that the company will refocus on providing returns to investors. Barrick's stock has lost roughly 40% of its value since the beginning of 2013 and the company currently holds $11.6 billion of debt. Adding to the friction was incoming co-chairman John Thornton's recent $11.9 million signing bonus, which aroused discontent from a group of institutional investors. Yesterday shareholders voted against Barrick's approach to executive compensation, reflecting broader opposition to its current bonuses. 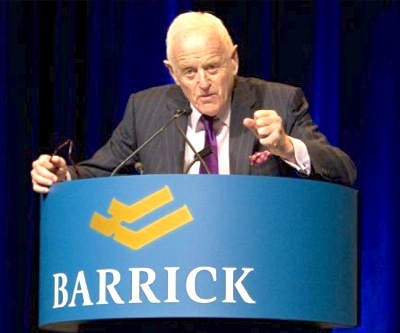 At the meeting Barrick founder Peter Munk adamantly defended Thornton, Monk's hand-picked choice for chairman. The volatile gold price, which has found some recent stability above $1,400, continues to threaten profits of gold companies worldwide.